The "Johnnies" and the "Mids" vie for the coveted Annapolis Cup during this annual rite of spring. 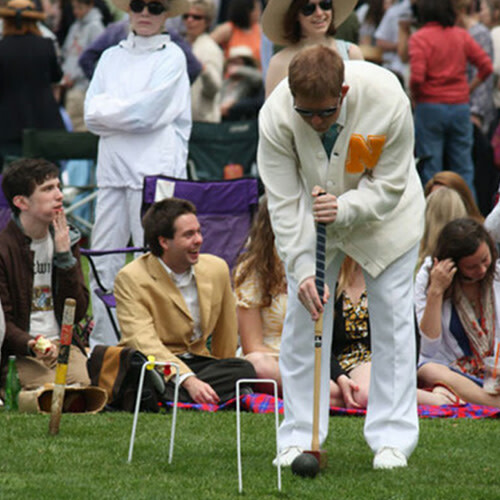 The croquet match brings together two starkly different institutions for an event Sports Illustrated says has "no parallel in intercollegiate sports." Attendees dress "Great Gatsby"-style while enjoying a lavish lawn party that includes serenades by the St. John's Freshman Chorus and swing music provided by the Naval Academy's Trident Brass Band. The "Johnnies" play in different "uniforms" each year - ranging from camouflage khakis, to U.S. Naval Academy imitation Crackerjack, to Vikings' attire, to bare feet. The "Mids" follow the United States Croquet Association dress code. Current St. Johns students and Midshipmen can attend free by showing their student ID on game day, and do not need tickets. St. John's alumni may purchase reduced price tickets. Originally King William's School founded in 1696. Site of Revolutionary and Civil War encampments. A long tradition of liberal arts education with present great books curriculum. Traces its origins back to King William's School founded in 1696. Site of Revolutionary and Civil War encampments. Continues a long tradition of liberal arts education with present "great books"